Not your average chicken vegetable soup. 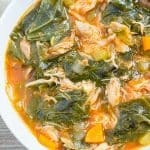 We've upped the ante, went southern, and added beloved collard greens! Add chicken, chopped onion, garlic, thyme, oregano, red pepper flakes, and bay leaves to pot. Then add water and lock lid. Set manual timer for 30 minutes at high pressure. Remove stems from collard green leaves and separate leaves into 2 pieces. Discard stems. Cut leaves into 1-inch pieces so that they are easily spoonable. This is easiest by stacking several leaves at a time. Once cook time is complete, allow pressure to release naturally for about 30 minutes. If there is any pressure left at that point, go ahead and quick-release remaining pressure. Remove leg quarters and transfer them to a large bowl. Pour broth through a fine mesh strainer and set aside. Discard cooked aromatics. Add olive oil, onions, celery, carrots, and 1 teaspoon salt to pot. Sweat vegetables for about 5 minutes, stirring frequently. Add broth to pot, along with 2 teaspoons salt, tomatoes, rinds (if using), collard greens, brown sugar, and black pepper. Mix well, lock lid, and cook for 10 minutes at high pressure. Meanwhile… remove all chicken meat from bones in large pieces. Discard all skin and bones. Once cook time is complete, quick-release pressure. Then add chicken and gently mix well. Serve each bowl topped with a spoonful of basil pesto (with cornbread dumplings) & enjoy! I'm pretty sure using any combination of chicken pieces (or even a whole chicken) would work for this recipe with one exception: boneless, skinless chicken breasts. In my opinion, they just don't have enough flavor to season the broth properly. However, if your goal is to create this dish as guilt-free as possible, and using breasts is a must, I would also use store-bought chicken broth (or stock) instead of water. Then cut the chicken cook time to 8 minutes with a natural pressure release. Recipe adapted from our favorite cookbook, Deep Run Roots by Vivian Howard.